I walked toward the stall and saw six nameplates on the door. The top plate said Alydar. I moved on to the next stall… Whirlaway. And the stall across the way… Citation. For lovers of American Thoroughbred horse racing history, there are few places that evoke the emotions one feels standing in the famous stallion barn at Calumet Farm. 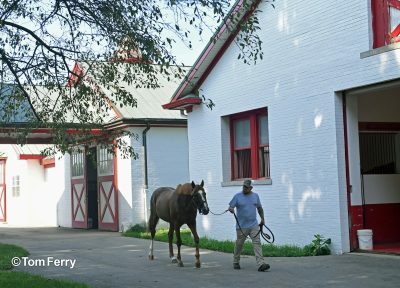 Calumet Farm’s historic stallion barn (photo by Tom Ferry). Drive along both Versailles and Van Meter roads in Lexington, Kentucky and you can’t miss it. The white, four-board fences, barns and outbuildings that are trimmed with rich green and red, and the distinctive red gate at the farm’s entrance. The numbers produced at these 762 acres are staggering — a record eight Kentucky Derby winners, two Triple Crown-winning colts and three Filly Triple Crown winners. The farm has produced 11 horses that were inducted into the National Museum of Racing and Hall of Fame and six horses that were named Horse of the Year in the 1940s. It all began more than 100 years ago and 400 miles away from Lexington in Libertyville, Illinois. William Monroe Wright was the founding owner of the Calumet Baking Powder Company and loved Standardbred trotting horses. Ten years later, in 1924, Wright relocated Calumet to Kentucky to take advantage of the more favorable climates for his horses. When Wright died in 1932, his son Warren Wright Sr. took over the business and set about converting Calumet into a Thoroughbred breeding and training operation. After Wright purchased interest in the successful European sire Blenheim II, he purchased a young colt in 1936 named Bull Lea, who became the farm’s foundation sire and Calumet would soon become one of the most successful operations in Thoroughbred racing history. Calumet Farm (photo by Tom Ferry). For five decades, Calumet garnered more than 2,400 wins with total earnings of over $26 million. The farm was the number one money-earner in horse racing for twelve years. Its dominance of racing in the 1940s was unlike any stable before or since. Led by trainer Ben A. Jones and his son Jimmy, the Calumet reign would begin in 1941, when Whirlaway captured the Triple Crown. Soon to follow were championship seasons from Twilight Tear, Armed, Coaltown, Pensive and Ponder. In 1948, the great Citation became Calumet’s second Triple Crown winner in seven years and, three years later, “Big Cy” became the first Thoroughbred racehorse to win $1 million. When Warren Wright died in 1950, his widow Lucille Parker Wright inherited Calumet and ran it successfully for more than 30 years. While the dominance of the 1940s had passed, the devil’s red and blue silks were continually showcased in winner’s circles across the decades and included Kentucky Derby wins in 1952, ’57, ’58 and ’68. Calumet rose to prominence again in the late 1970s behind trainer John Veitch and champions Our Mims, Davona Dale, and Before the Dawn. In 1978, a Calumet three-year-old superstar reminded racing fans of the farm’s glory days. As part of one of the greatest rivalries in the sport’s history, Alydar finished a close second to Affirmed in all three thrilling renditions of 1978’s Triple Crown races. He retired to stud the following year and became a major success for Calumet, siring such champions as Easy Goer, Alysheba, Strike the Gold and so many others. 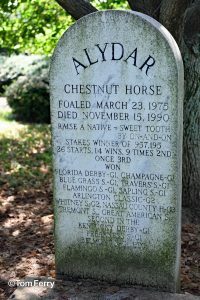 Despite his success, Alydar could not prevent the farm from entering a period of serious decline in the 1980s. When Lucille Wright Markey died in 1982, the farm passed to the heirs of Warren Wright. In 1990, Alydar was America’s leading sire, but after his mysterious death on Nov. 15 of the same year, a cloud of suspicion was cast over the business and accelerated Calumet’s continued collapse. Not long afterwards, the farm went bankrupt, dispersed its horses, and sold the original devil’s red and blue silks to a Brazilian investment group. In 1992, Calumet was put on the auction block. And then everything changed overnight, and Calumet rose from the ashes. Successful businessman Henryk de Kwiatkowski from Canada always admired the beauty of Calumet during his trips to Lexington. When he learned the farm was up for auction, he seized the opportunity and won ownership with a closing bid of $17 million. During the following ten years, Kwiatkowski and team restored Calumet to its former beauty. In 2012, The Calumet Investment Group purchased the farm for $35.9 million and leased the farm to American businessman Brad M. Kelley. The following year, Calumet won its eighth Preakness Stakes title when Oxbow captured the 138th running of the classic race wearing the farm’s new black silks with gold chevrons. Calumet Farm’s cemetery is a resting place for numerous horse racing legends (photo by Tom Ferry). We will likely never see again the dominance achieved by Calumet in the 1940s; however, the farm has returned to eminence on the Thoroughbred racing stage. Kelley has continued to invest both dollars and horses into the operation and this is evident today via a strong collection of twelve stallions. Stalls once occupied by the likes of Citation, Bull Lea and Tim Tam are now home to Oxbow, champion English Channel and Keen Ice. Calumet has never forgotten its past. The farm’s philosophy is to model the past and raise a good horse. And not just a good sales horse, but a good, sturdy two-turn Derby horse. A visit to Calumet today is an echo of yesteryear. Thirty-five miles of iconic white fences surround the lush landscape. The farm’s training track, stables and barns have changed very little across 75 years. If walls could talk, it would be fun to enter the two-and-one-half-story, brick Main House on the southwest corner of the property. MWhen I stepped foot onto the 6666 Ranch, I gazed up at a big, blue, beautiful Texas sky and couldn’t imagine it any other way — legendary Quarter Horses, a family legacy, superior Black Angus Cattle and oil. These are the hallmarks of this iconic landmark. Also known as the Four Sixes, the ranch may well be the most important place in the history of American Quarter Horse racing. The ranch’s main headquarters is in Guthrie, Texas. This isolated town of 160 residents has one store, one gas pump, and is 30 miles to the next closest gas station and an hour and a half to the next town. More than 48 windmills dot the Four Sixes’ 275,000-acre landscape, which includes another location near Panhandle, Texas. This enterprise collectively known as the Burnett Ranches once encompass more than a third of a million acres. The Four Sixes uses the “L” brand to mark their Quarter Horses (photo by Tom Ferry). The origin of how the Sixes got its name has led to some colorful stories across the years. The most popular tale is that 6666 founder Samuel “Burk” Burnett won the original ranch in a poker game, with a winning hand of four sixes. It’s a fun and engaging story — but it never happened. The truth is Burnett purchased 100 head of cattle wearing the “6666” brand in 1868 and, with the title to the cattle, came ownership of the brand. Today, the Four Sixes remains one of the most prominent commercial cattle ranches in Texas and maintains a breeding herd of some 7,000 mother cows who continue to display the 6666 brand. As the American West developed, with increased population during the late 1800s, open ranges began to disappear, as cattle owners were required to fence off their individual lands. Burk Burnett set about acquiring his own land holdings and purchased the ranch in Guthrie that is the nucleus of what is the 6666 Ranch today. It was the discovery of oil on Burnett land that allowed the business to grow. The first discovery occurred in 1921 at the location north of Panhandle, and the resulting well produced constantly for more than 50 years. Another large field was struck in 1969 at the 6666 Ranch in Guthrie — and that field is still being developed. Outside of oil, the most important change was the addition of a formal equine breeding program at the Sixes in the 1960s. The ranch established a legacy for breeding world-class American Quarter Horses back in the 1940s, with influential stallions Hollywood Gold and Grey Badger II; and Cee Bars added to that tradition throughout the 1950s. 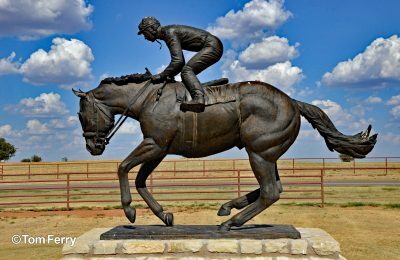 Dash for Cash is remembered under a big blue Texas sky (photo by Tom Ferry). Fans of horse racing will always debate over who is the greatest horse the sport has ever seen. When it comes to American Quarter Horse racing, however, conversations often begin with one name — Dash For Cash. During his 23 years on earth he illuminated the skies of the industry both on the racetrack and in the breeding shed. On the track, he was a two-time world champion, winning 21 of his 25 career starts and amassing $507,687 in earnings. He retired from racing at the close of the 1977 season and spent the remainder of his life at stud at the Four Sixes. As a stallion, he sired 751 winners, with 135 stakes winners and 16 world champions. In May of 1996, Dash For Cash was euthanized due to complications of equine protozoal myeloencephalitis (EPM). The succession of champions associated with the Sixes that followed includes some of the greatest names the sport has known. Mr Jess Perry became a living legend as one of only three Quarter Horses to sire racing earners of more than $52 million. His son One Famous Eagle won more than $1 million on the track and is the all-time leading first crop sire in history. Other greats have included Special Effort, Streakin Six and Eyesa Special. Today, the ranch stands 15 to 20 of the top racing, performance and ranch Quarter Horse stallions found anywhere in the world. Each year, between 1,000-1,250 mares are bred at a state-of-the-art facility and the Sixes maintains its own elite broodmare band of nearly 160. Throughout their long and colorful history, the Burnett Ranches have been a story of family. When Burk Burnett died in 1922, the legacy continued with son Tom, who continued the growth and reputation of the enterprise. The third generation assumed the mantle in 1938 with Anne Valliant Burnett. “Miss Anne” took special interest in the ranch’s Quarter Horse breeding operation and assisted in the creation of the American Quarter Horse Association (AQHA) and the sport’s Hall of Fame. Prior to his death in 1922, Burk Burnett willed the majority of his estate to Miss Anne in a trusteeship for her yet unborn child. When Anne died in 1980, her only child and daughter, Anne Burnett Windfohr Marion took over control of the Sixes and inherited her great grandfather’s ranch holdings by direction of his will. “Little Anne” grew up on the ranch and learned to ride horses and earned the respect of the ranch’s cowboys. As with prior generations, she has a deep commitment to the continuing success of the ranch. If you look around the 6666 Ranch and have a sense of déjà vu, it may be because the land was seen in advertisements for Marlboro cigarettes in the 1960s and 70s. The cowboys here are straight out of central casting and many ranch employees are among the second or third generation from their family to work at the Sixes. 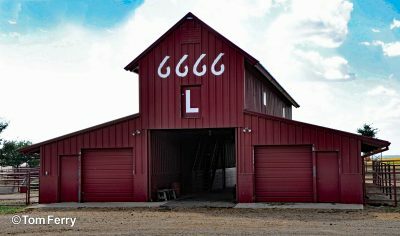 Visitors to the ranch can stop by the famous 6666 Supply House on the way into town. Guthrie’s only store was built in 1900 by Burk Burnett and is still a place where both employees and locals can purchase items such as groceries, clothing, hardware and tires. At the ranch, one of the highlights is the 11-bedroom ranch home built by Burnett for $100,000 in 1917, an incredible sum of money at that time. It was here where Burnett hosted Theodore Roosevelt, Will Rogers and other friends. Perhaps what is most magical about the 6666 Ranch is a red 16’x16’ stall on the grounds. For so many years, it was home to Dash For Cash and, today, champion One Famous Eagle will peer out at you from the same stall. It is sacred ground in the world of American Quarter Horse Racing and symbolic of the tradition of excellence the Four Sixes has consistently showcased for 100 years. When you close your eyes and imagine a classic Texas ranch, the Four Sixes is what you see. Allaire du Pont once rode Kelso along the trails of Woodstock Farm (photo by Tom Ferry). With the utmost respect to Secretariat, Man o’ War and Citation, he may have been the greatest of them all. He won an unprecedented five consecutive Horse of the Year awards. He set nine track records, was victorious on twelve different tracks, won on dirt, grass and mud — in winter, summer, spring and fall. He carried 130 pounds or more on his back 24 times, yet still won 13 of those races, placing in five and finishing third once. Kelso was the all-time money winner when he retired and it was a record which lasted for fourteen years. 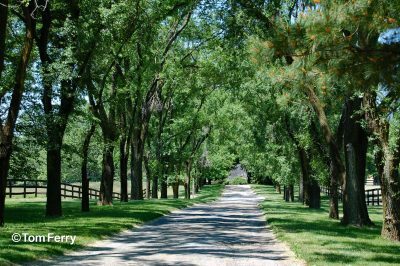 Enter the front gates of Woodstock Farm in Chesapeake City, Maryland and walk along a beautiful road, lined with tall sycamores and pines, and you will feel their spirit wherever you go. They are Kelso and his beloved owner, Allaire du Pont. Foaled at Claiborne Farm in Kentucky in 1957, Woodstock was Kelso’s home for most of his 26 years. This former cattle farm and its 300 acres was purchased by du Pont and her husband Richard in 1941. They eventually expanded the property to 800 acres and moved their horses and Bohemia Stables operation from Middletown, Delaware to this historic town on the banks of the Chesapeake and Delaware Canal. It was an idyllic second home and retreat for Allaire and Richard to spend time with their two young children and enjoy a shared passion for horses and planes. Tragedy struck, however, in 1943 when Richard and three other men were killed when a glider they were flying malfunctioned. Kelso and his dam, Maid of Flight, left Claiborne and came to Woodstock. He was a scrawny colt with an attitude. Allaire du Pont gelded him with hopes of calming him down, but it didn’t seem to help. He continually dumped his riders and was a cribber to boot. She tried selling the son of Your Host in 1959, during his two-year-old season, but nobody was interested. A diamond lay hidden in the rough however. “Kelly’s” inner competitive fire reaped benefits as a three-year-old in 1960, when he won eight of nine starts and captured the first of what would be multiple Horse of the Year and divisional honors. The trophy room in the office at Woodstock Farm (photo by Tom Ferry). There was no looking back. With each passing season, Kelso’s trophy case grew and so did the size of the crowds at his races and his incredible popularity among American sports fans. Offseason periods of rest and relaxation were spent at Woodstock. He lived in a very large stall, with his name on the welcome mat, and slept on a bed of sugar cane fibers. He drank only bottled Mountain Valley spring water from Arkansas due to recurring bouts with colic. And his diet? In addition to the normal hay and roughage, the mud-colored gelding had a sweet tooth that resulted in ice cream sundaes and his fans would send lumps of sugar individually wrapped in paper bearing his name and photograph. Kelso had his own private mailbox at Woodstock to accommodate an incredible volume of fan mail. At the peak, he received up to 500 letters a week from fans of all ages — and each letter received a response. Through the years, he shared his paddock and stall with a number of beloved canine and equine friends. His personal bodyguard was a small dog named Charlie Potatoes who slept with Kelso at night and rarely left his sight. He also grew close to stable ponies and longtime friends Spray and Pete. After an injury in the spring of 1966, nine-year-old Kelso was retired from the sport and returned to Woodstock for good. Allaire du Pont would ride Kelso across the grounds of the farm, galloping through the surrounding woods, streams and trails. One year after his retirement, Kelso learned to become a show jumper and, in subsequent years, would perform at racetracks across the country and at Madison Square Garden. At home in Maryland, he participated with du Pont in fox hunts and the competitor glint was still present in his eye as he watched Woodstock horses breeze on the training track from the far end of his paddock. In 1974, a 17-year-old Kelso was slowed by arthritis and only occasionally accompanied Mrs. du Pont on her journeys around the farm. In the early ‘80s, he was well into his twenties and visitors still came to see him. On Oct. 16, 1983, Kelso died at the age of 26. A heartbroken Allaire du Pont buried him in an equine cemetery behind the farm office within a circle of Greek columns and tall trees. 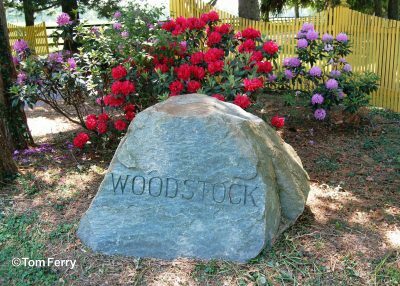 Woodstock had been du Pont’s primary home since 1960 and she continued to live at the farm until her death at age 92 in 2006. Woodstock Farm still thrives today, with half of the farm dedicated to farming and the other half to the breeding of thoroughbred horses. Visitors are welcome and can visit the farm office, a former late-1800’s post office which serves as a small museum, paying tribute to the life of Mrs. du Pont. 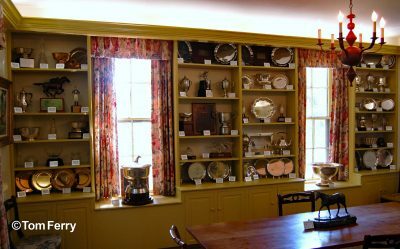 An entire room is dedicated to a life of racing success with walls and shelves adorned with photographs, paintings, plaques, trophies and sculptures. Other exhibits highlight du Pont’s passions for aviation, needlepoint, fox hunting, land preservation and the plight of abandoned animals. 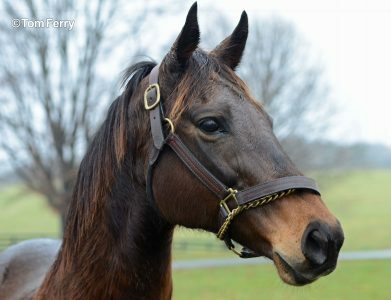 Hermitage Farm’s Caressing was an Eclipse Award winner and the dam of another (photo by Tom Ferry). Walk through the doors of the main office at Hermitage Farm in Goshen, Kentucky and, as you approach the front desk, you will see them. Framed memories. Snapshots in time. Reminders of a heritage which began to take root in the mid 1930’s and focuses on — the horse. Lining an office wall are photographs of thoroughbred champions across nearly 70 years who have called this historic 700-acre estate home. Their accomplishments placed them, for a time, near the top of the horse racing world. They took home trophies for winning the Kentucky Derby, Kentucky Oaks, the Breeders’ Cup World Championships, the 2000 Guineas Stakes and, most recently, the Travers Stakes at Saratoga. Hermitage was home to the most expensive yearling ever sold at a public auction and also North America’s leading sire of 1980. The farm was purchased by Captain John Henshaw back in the early 1800’s and it remained in the family for nearly 100 years until it was sold in 1935. The buyer was a 19-year-old young man whose great-great-great uncle was the founder of the Kentucky Derby. And, soon, this young man would leave his own imprint on the history of thoroughbred racing. His name was Warner L. Jones Jr. and he farmed the land, began with a single yearling and then added a mare. It was a simple beginning on a road that would see Hermitage become one of the most famous thoroughbred farms in America. Seventeen years later, Jones’ operation had increased significantly and one of his home-bred three-year-olds entered the starting gates as a 25-1 longshot in the 1953 Kentucky Derby. The colt’s name was Dark Star and he faced the daunting task of going up against the spectacular Native Dancer, who entered the Derby unbeaten in eleven races. Dark Star broke early, held a clear lead throughout and held off Native Dancer’s powerful finish to win by a head. It was one of the biggest upsets in Derby history and Hermitage Farm was suddenly on the map. At the close of 1972, a stallion came to Hermitage who would take the farm to the highest level of thoroughbred breeding across the world. His name was Raja Baba. He was syndicated in 1972 in a 36-share deal at $10,000 per share. Ten years later, that selling price had increased to $205,000 per share on the open market and, later on in his career, a share reportedly sold for $380,000. As a freshman stallion in 1976, Raja Baba was the leading juvenile sire and, four years later, he became the overall leading sire in the United States. Raja Baba died in 2002 at the age of 34. During his career at stud, he sired 62 stakes winners, two Breeders’ Cup winners and two champions. He brought attention to Hermitage over the years that opened other doors to success. In 1985, Warner Jones sold a half-brother to the Triple Crown champion Seattle Slew for a world record $13.1 million at Keeneland’s July Select Yearling Sale. The yearling’s name was Seattle Dancer. In that same year, Hermitage Farm set a record for the highest average price — $2,433,750 — for horses consigned for sale. It is a record that still stands. In 1995, the Jones family sold Hermitage to 55-year-old Carl Pollard. It was Pollard’s vision to carry on the Hermitage tradition established before him. Pollard and team began to buy mares and some yearling fillies to hopefully race and turn into broodmares. In 1999, Pollard purchased three fillies. One of the fillies was a small dark bay who was purchased for $180,000. Her name was Caressing. And, on a fall day in November of 2000, she reminded the racing world of Hermitage when, as the longest shot on the board at 47-1, she upset the field and won the Breeders’ Cup Juvenile Fillies world championship. Nearly three months later, Carl Pollard took his staff down to New Orleans as Caressing won the 2000 Eclipse Award for Champion 2-Year-Old Filly. When Caressing retired and became a broodmare, she had some modest success but it was a mating in 2013 with Claiborne Farm’s Flatter, however, that changed everything. Caressing gave birth to a colt who was entered in the Keeneland September 2015 Yearling Sale. The colt sold for $425,000 and was named West Coast. In 2017, his victories included the Pennsylvania Derby (G1), the Travers Stakes (G1) and ran an impressive third in the Breeders’ Cup Classic (G1) in November (a race he is entered in this year as well). At year’s end, this son of an Eclipse Award winner captured his own when he received 3-Year-Old Male championship honors. Hermitage has been the site over the years for lavish parties and events (photo courtesy of Hermitage Farm). In 2003, Hermitage was purchased by Steve Wilson and Laura Lee Brown, owners of the Louisville-based 21C Museum Hotel chain. The married couple is fulfilling their long-term vision to create a destination celebrating the heritage of Kentucky and its signature industries — food, bourbon and horses. The historic main house, which has been the iconic image of Hermitage since 1835, has been restored and is available for rentals and events. Couples come here for their weddings and get the horses, rolling hills and a beautiful home. It encapsulates what they love so much about Kentucky. During next May’s Kentucky Derby weekend, Hermitage will host tourists with the grand opening of a farm-to-table restaurant, a bourbon-tasting experience and a farmer’s market within one of the more than 30 barns on the property. And next to a creek at the back of the estate, visitors will eventually enjoy a studio projection-with-sound experience, where high-definition projectors display trees, hillsides, rocks and pools of water to create a totally immersive atmosphere. You might just see leaves in the trees turn into butterflies and fly away. There is certainly excitement in the air with growing anticipation of expansion and tourist counts in coming years. But a new photograph has recently been added to the office wall in the main office during the past year. Multiple Grade 1-winner West Coast is symbolic of the farm’s heritage since Warner Jones bought his first yearling back in 1936. Broodmares, foals and yearlings continue to graze the land. In an industry that has seen its share of struggles in recent years, life goes on at Hermitage. Fashion, hats and the pageantry of spring (photo by Tom Ferry). Mention Tennessee to most people and what normally comes to mind is country music. Music City, U.S.A. It is also a state known for its universities, the Great Smoky Mountains, Andrew Jackson and Elvis. While the state’s neighbor Kentucky to the north is known more for equine racing and breeding, there are more horses per capita in Shelby County, Tennessee than any other county in the United States. And the state has its own annual rite of spring one week after the Kentucky Derby when the Iroquois Steeplechase is run on the second Saturday of May. 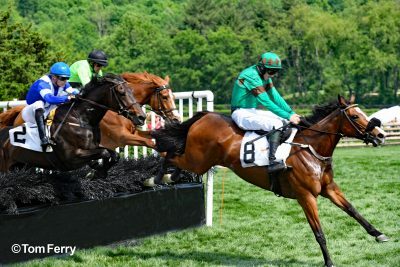 On this one Saturday during the past 77 years, Percy Warner Park has been the heart of the steeplechase world and holds a deserving place in the history of American horse racing. They begin arriving at Percy Warner Park before 8 a.m. on Saturday morning. The day’s seven-race card is still more than five hours away, but the competition almost feels secondary to the pageantry and the day-long party. Nearly 25,000 come from Tennessee and across the country each year to continue this annual celebration of horse, hats and hounds. They come wearing their fashionable Sunday best to attend the premier spring race meet in American steeplechasing. The Iroquois Steeplechase is more than just a horse race — it is a Nashville tradition that ties people from the community together. Another glorious day for the Iroquois Steeplechase (photo by Tom Ferry). A good portion of that community congregates in the park’s infield. Tailgating is an individually organized science here and thousands show up early to set up their tents. Even the infield has its strategic destinations and is divided into six regions known as Centerfield, Midfield, The Stretch, Topside, The Turn and The Meadows. Walk from tent to tent and you’ll encounter the finest in southern hospitality, live music, delightful cuisine and plenty of Tennessee Whiskey and Honey Jack Juleps, among various other libations. The Iroquois Steeplechase has been run each year since 1941, with the exception of one year during World War II. The race has been run under threatening weather conditions and even endured the Nashville Flood of 2010. Remember, we are talking about a wide-open city park here. Tents can come in handy from time to time. And large VIP groups revel in tented luxury in the high-dollar Hunt Club, Paddock Club, Hospitality Village, Tents in the Turn and the Skybox Suites. Highly desired box seats overlook the grass track and have been passed down by families through the generations. Some families have retained their seats from the race’s earliest years in the 1940’s. While many Iroquois attendees will tell you they come for the party, it is the thrill of steeplechase racing and the thoroughbreds that helps keeps fans at the park for the full day and coming back year after year. In the steeplechase world, these Nashville races have the largest purses of the spring season. 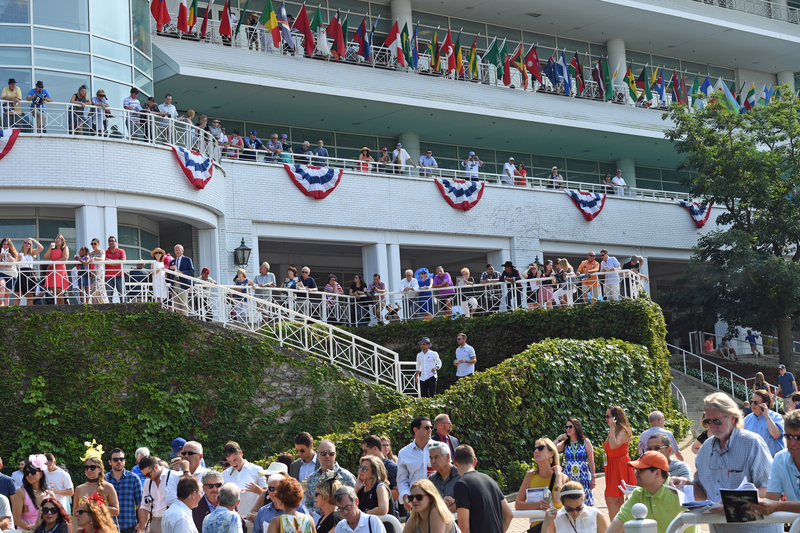 The day is comprised of seven races for horses aged 4 years and up over the three-mile turf track for more than $500,000 in purses, bonuses and awards. 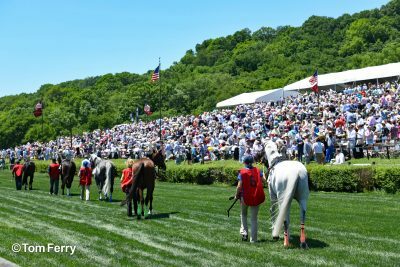 The Iroquois Steeplechase is run by a nonprofit organization and, since 1981, has raised more than $10 million for the Monroe Carell Jr. Children’s Hospital at nearby Vanderbilt University. The Iroquois Steeplechase is one of the premier steeplechase events in the United States (photo by Tom Ferry). The Iroquois course is regarded as one of the best racing surfaces in the country and was one of the first steeplechase courses to use an irrigation system, which is maintained year-round. The races on the course range in distance from 2 ¼ to 3 miles over a series of four-foot national and timber fences. The race day builds and culminates with the running of the $200,000 Grade 1 Calvin Houghland Iroquois Hurdle Stakes. The winners of the Iroquois over the years have included a Who’s Who of some of the greatest of American steeplechase horses, including Eclipse Award champions Flatterer, Lonesome Glory, Correggio, All Gong, Good Night Shirt, Divine Fortune, Rawnaq and 2017 champion Scorpiancer. To commemorate 75 years in 2016, the Iroquois Steeplechase created what is known as the TVV-Iroquois Cheltenham Challenge — a transatlantic rivalry that includes two of the world’s biggest steeplechase races, the Iroquois Steeplechase in Nashville, and the Cheltenham Festival in England. The partnership offers a $500,000 bonus challenge to any horse that can win both the Ryannair Group 1 World Hurdle at Cheltenham in March and the Calvin Houghland Iroquois in May, or vice versa, within a 12-month period. 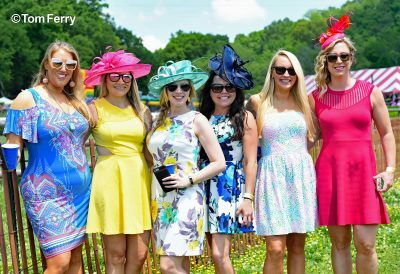 Year after year, the Iroquois Steeplechase can best be described as a celebration — of spring, of pageantry and of horse racing at its finest. 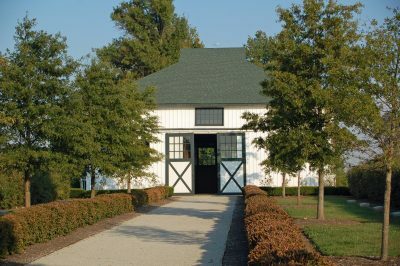 Exterior of Secretariat’s foaling shed (photo by Tom Ferry). It happened here shortly after midnight on March 30, 1970. Outside, it was a cold and rainy early Virginia morning; yet, inside the small wood-frame foaling shed, Meadow Farm manager Howard Gentry, his assistant Raymond Wood and night watchman Bob Southworth, were focused on an 18-year-old mare named Somethingroyal. She was giving birth and Gentry helped ease her foal’s folded foreleg out of the birth canal. The morning sun would soon rise and the world of horse racing had changed forever. The real-life birth of Secretariat bore little resemblance to the one portrayed in the 2010 Disney movie. Owner Penny Chenery, trainer Lucien Laurin and groom Eddie Sweat were not there — but the modest little structure made of whitewashed barn board was and is present today. 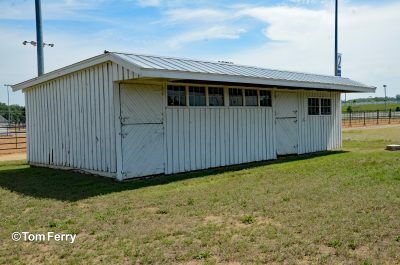 Located in the Meadow Event Park in Caroline County, Virginia, Secretariat’s foaling shed was named to the National Register of Historic Places by the National Park Service in 2015. It is a part of land that dates back to 1805. Some of the original blue paint is still visible on Secretariat’s foaling shed (photo by Tom Ferry). In 1936, Christopher T. Chenery purchased The Meadow, an ancestral property near Doswell, Virginia and not far from his boyhood home in Ashland, Virginia. Soon afterwards, Chenery created Meadow Stud, which bred thoroughbreds and raced them in the now iconic silks highlighted by blue and white blocks. Over the years, Chenery and Meadow Stable produced numerous champions including Hall of Famers Hill Prince and Cicada. In 1965, Chenery partnered with Ogden Phipps in a foal-sharing agreement. Phipps owned leading sire Bold Ruler and sought out Chenery’s best mares at Meadow Stable. After Chenery fell ill and was hospitalized in 1968, Phipps and Chenery’s daughter Penny flipped a coin the following year to determine who would win first choice of Bold Ruler’s foals out of Somethingroyal. Phipps won the toss and selected the first foal, a filly named The Bride. The filly ultimately ran four times and never won a dollar. Penny Chenery had to “settle” for the second foal, a male — and the rest of the story is legendary. The Chenery family sold the Meadow Farm land in 1978 and, in 2003, it was purchased by the State Fair of Virginia, which turned it into the Meadow Event Park. The 331-acre property is currently owned by the Virginia Farm Bureau Federation. Within the Event Park is the “Meadow Historic District”. This includes Secretariat’s training barn where he wore his first saddle and bridle, the yearling barn where he and the great Riva Ridge lived as colts, and a stallion barn, pump house, well house and horse cemetery. As the years rolled by, the original broodmare barn could not be restored; however, visitors can still gaze upon the “Cove,” the expansive grassy field in a valley where the Meadow mares and foals once grazed. What most tourists from across the country and around the world come to see, however, is the foaling shed. There are few places its equal when it comes to sacred ground in the world of horse racing. 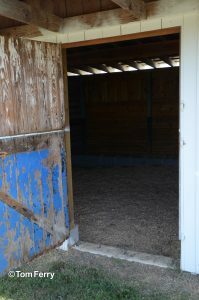 When approaching the shed’s entrance, one instantly sees the remaining fragments of Meadow Stable blue paint which still cling to the lower half of the inside portion of the door. And upon entering the shed, you find yourself in a small partitioned area. It is here that Secretariat came into the world. There is very little to see, but much to imagine. Throughout the year, the Meadow Event Park provides “Hoofprints of History” tours of the Historic District. Visitors can stop by the legendary barns and grounds, as well as view pictorial galleries and rare exhibits that illustrate Meadow Stable’s glory days. And they can marvel at how such humble surroundings could host what is arguably the greatest of all American thoroughbreds. Seabiscuit’s stud barn is listed in the National Register of Historic Places (photo by Tom Ferry). If you told somebody the story before they read the book or saw the movie, they wouldn’t believe you. They would be skeptical that a beaten-down horse that won less than a quarter of its first 40 races could have inspired millions during the Great Depression. And if you told them both horse and jockey each suffered what were thought to be career-ending leg injuries, yet would recuperate together and come back to win one of the richest races in history, they might have laughed out loud. Yet it happened. And the faces and places were real. 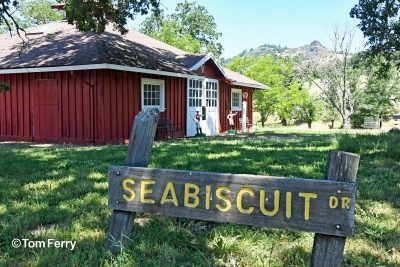 While it has been more than 70 years since he walked the earth, there is no site where the spirit of Seabiscuit is more alive than at his longtime home of Ridgewood Ranch in Willits, California. Located 2 ½ hours north of San Francisco on 5,000 acres of Northern California oak and redwood-studded hillsides, Charles S. Howard purchased this land as a cattle ranch and second home in 1919. One decade later, he had transformed a portion of the ranch into a Thoroughbred breeding and training operation. This included a 90-acre central area, highlighted by several historic structures still present at Ridgewood. One, however, is more iconic than all the others — Seabiscuit’s stud barn. This wood-framed building, clad with red board and batten siding and white, flat-sawn window and door trim, holds a special place in the annals of horse racing. It was here where Seabiscuit rehabilitated for the better part of 1939. It was here where he retired the year after his thrilling comeback race in the Santa Anita Handicap and began a stud career that saw him sire 108 foals. 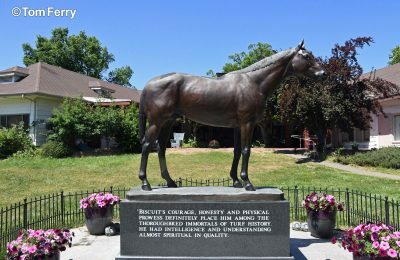 Seabiscuit’s statue sits in front of the one-time home to the Howards (photo by Tom Ferry). Visible in so many photographs, the barn was a destination for more than 50,000 visitors from 1940 until 1947. During the initial seven months of 1941, an incredible 33,072 people signed the guestbook outside his stall. Charles Howard posted a welcome sign at the entrance to the farm and built a small grandstand for visitors just outside the horse’s stall. Listed in the National Register of Historic Places, Howard designed the barn specifically for Seabiscuit. The four stalls inside the barn, one in each corner, were originally accessed by four large paddocks, however, only the stalls remain today. Those stall doors are adorned with the names of great horses owned by the Howard family through the years including Noor, Kayak II, Ajax and, of course, The Biscuit. The Howard family sold the whole estate in the early 1960s and the stud barn was restored in 2004 after many years of serving as a storage facility and printing office. There are several artifacts from the Howard era that are still present in the barn and these include the horse-and-rider weather vane on the roof and two red-and-white lawn jockey figurines. Within view of the stud barn is the lavish, Craftsman style, one-time home to Charles and Marcela Howard. The home’s interior appears frozen in time, as if the Howards could walk in at any moment. In front of the home stands a beautiful bronze statue of Seabiscuit. It is a replica of the Ridgewood original which was moved to the National Museum of Racing and Hall of Fame in Saratoga Springs, NY. Charles and Marcela had several Hollywood celebrity friends who were frequent visitors to Ridgewood, including Bing Crosby, Clark Gable and Carole Lombard. Walk the grounds of the ranch and you’ll pass the pool where child star Shirley Temple learned to swim. The restored carriage house was home to automobiles during the glory years and one can also see the bath houses once used by family and guests. 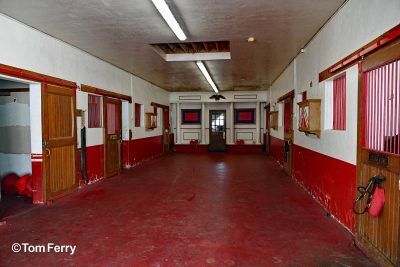 There are the historic mare barns whose barn doors are still adorned with the iconic red, white triangle and “H” logo present on Howard racing silks. Seabiscuit’s stall (photo by Tom Ferry). Drive throughout the Ridgewood area and you might get lucky and see white or fallow deer which Charles Howard introduced to the area in 1949 when he purchased 53 of the deer from his friend William Randolph Hearst. The land is also home to several native species including the golden eagle and California mountain lion. When driving around the ranch, it is also sobering to know it is here where Howard’s 15-year-old son Frank was killed in a vehicle accident in May of 1926. The tragedy led Howard to fund the construction of the Frank R. Howard Memorial Hospital which opened two years later in Willits. In 1962, Christ’s Church of the Golden Rule purchased the ranch and owns it to this day. It has taken steps to preserve the ranch’s historic and environmental value and the restoration of historic buildings is ongoing. The ranch began giving historic tours in 2001, shortly after Laura Hillebrand’s award-winning Seabiscuit: An American Legend was published, and they are still available from June-September. There is one thing visitors will not see — Seabiscuit’s final resting place. On May 17, 1947, he died six days short of his 14th birthday. A heart-broken Charles Howard buried the horse at an undisclosed location on the grounds, somewhere under a newly-planted oak tree. The location of that tree remains a Howard family secret to this day. It doesn’t really matter, however, because visitors to Ridgewood Ranch will sense his presence everywhere. What is most compelling is not the statue, but, rather, what it represents — the fighting spirit of community and the warrior hearts of two racehorses. It is a place where one can stop and remember, or simply imagine. 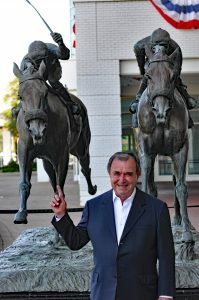 John Henry’s trainer Ronald McAnally in front of the Against All Odds statue at Arlington Park (photo by Tom Ferry). Five-time Kentucky Derby-winning trainer D. Wayne Lukas once said if someone has never been to a racetrack before, their maiden voyage should be to Arlington International Racecourse. Each year, from the first Friday in May until the leaves begin to show traces of burnt orange in late September, this majestic racetrack, located 30 miles northwest of Chicago, plays host to trainers, jockeys and horses from across the Midwest and throughout the racing world. It is a track with a grand history and if one were asked to describe Arlington’s past and present with one word, the answer would be perseverance. The bronze statue is hard to miss by anyone entering the racecourse, as it sits on a balcony overlooking a beautiful paddock. Named Against All Odds, the sculpture was designed by internationally renowned equine artist Edwin Bogucki, who also created the bronze Secretariat statue at the Kentucky Horse Park. Unveiled in 1989, Against All Odds captures one of the great moments in thoroughbred horse racing history. Eight years earlier, Arlington Park introduced the first $1,000,000 thoroughbred race. The race has had different names over 27 years, but today it is known simply as the Arlington Million. It is run each August and gathers some of the world’s great turf stars during the annual International Festival of Racing. The inaugural race on August 30, 1981 was broadcast on NBC to an estimated TV audience of more than 50 million. The richest race in history needed a great horse and it got one in the incomparable 6-year-old gelding John Henry, while also introducing us to a little-known Irish 5-year-old named The Bart. John Henry struggled early on in the race with a rain-soaked turf, falling back to eighth. At the half mile call, however, he found his footing and began to move up along the rail with a rhythmic stride, as Key to Content and 40-1 longshot The Bart battled for the lead. As the field of 12 hit the top of the stretch, the crowd of 30,637 roared as John Henry made his move. He and jockey Bill Shoemaker exploded down the middle of the track in full pursuit of The Bart, who had disposed of Key to the Content. John Henry closed the gap with each stride and finally caught his opponent at the wire — but the end result was too close to call. To most, it appeared The Bart had won by a narrow margin. The photo finish sign remained up for six minutes and when, at last, the board flashed the official results, the never-say-die John Henry had done it again in seemingly impossible fashion. With incredibly meticulous detail, the statue captures this final moment with jockey Eddie Delahoussaye aboard The Bart and Shoemaker on John Henry. The life-like monument includes names on the saddle cloths and captures the look of determination, heart and soul in the eyes of both horses and jockeys alike. Upon completion of the maiden Arlington Million, the future of the new and exciting turf race looked extremely bright. But everything changed four years later in the very early morning hours of July 31, 1985. Richard L. Duchossois (photo by Tom Ferry). Richard L. Duchossois received the phone call sometime after midnight telling him his racetrack was on fire. Arlington’s majority owner stood in Arlington’s parking lot around 4 a.m. and watched helplessly as the biggest fire the Chicago’s modern suburbs had ever seen to that point blazed out of control. Ultimately, more than 4,000 gallons of water per minute were used to combat the fire — but it just wasn’t enough. Duchossois later said he wasn’t concerned about saving the facility because it was beyond saving. The fifth running of the Arlington Million was 25 days away. In World War II, Duchossois commanded a tank battalion and on Sept. 15, 1944, he was shot in the side as his battalion crossed the Moselle River. The bullet caused nerve damage to his back and he was temporarily paralyzed from the neck down. His body was placed in a grouping of soldiers marked for dead, yet he was rescued and recovered. Four months later, he was hit in the face with a fragment of a grenade, yet rebounded once more. He received the Purple Heart for his injuries and his war experience taught him the power of teamwork, camaraderie and… resilience. 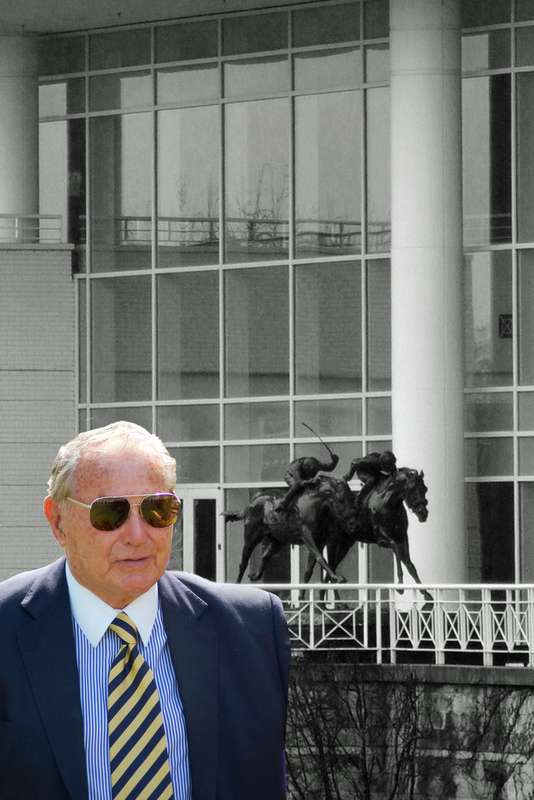 The day after the fire, Duchossois, Sheldon Robbins and the other owners mobilized and came up with a plan to remove the smoldering rubble and prepare the track for the Arlington Million. On Aug. 5, 1985, more than 200 crews worked practically around the clock, 20 hours a day, removing 7,000 tons of steel and 14,000 tons of other debris left behind by the fire. A 271,000 square foot area of new blacktop was created and, on it, was erected 43 red-and-white tents and temporary bleachers. Those who believed refused to say die and, on Aug. 25, “The Miracle Million” was run in front of a crowd of 35,651. Work began immediately afterwards on rebuilding the track. Four years later, in 1989, the work was completed and one of the most spectacular racing venues in the world was unveiled. Arlington Park was rebuilt post-fire into one of the world’s most spectacular tracks (photo by Tom Ferry). Sign in Oxford, Indiana (photo by Tom Ferry). Walk around this small Indiana town of fewer than 1,200 residents and he is everywhere. He has a small cafe named after him and you will find him on the top of the town’s water tower. His likeness welcomes you on billboards as you enter the city limits and you will find him on varied murals, plaques and street signs throughout the town. And yet, he left town for good nearly 116 years ago. Each decade across those many years has showcased legendary athletes who captivated America and often transcended sports by branching into popular culture. Their names are familiar to the average American sports fan in spite of passing time: Babe Ruth, Jack Dempsey, Red Grange, Bobby Jones, Jesse Owens, Muhammad Ali and Michael Jordan. But more than a century ago, from 1900-1909, a superstar in the world of sports captured the hearts and minds of Americans unlike any before him. He was a household name who endorsed cigars, washing machines, automobiles, toys, watches and much more. More than 90,000 people from all walks of life would routinely come from miles away and gather at local fairgrounds to see him compete. Today, however, his name and exploits are largely forgotten. His name was Dan Patch and he was called the “Epitome of Excellence in American Sports.” And even though he was billed as “kindhearted, generous and a staunch Methodist who never performed on a Sunday,” this idol was not human. He was, though, arguably the greatest harness racing horse who ever lived. Dan grew up in the small town of Oxford, Indiana in a barn that still stands today. The horse’s owner, Daniel Messner Jr., was a local storekeeper in Oxford who had aspirations of grandeur when he bred his five-year-old mare Zelica to the champion standardbred stallion Joe Patchen. Those dreams were quickly shattered on April 29, 1896 when the newborn foal arrived with legs so crooked and knees so knobby that some thought it would be a blessing if he didn’t survive the night. But survive he did. In the winter of 1899, three-year-old Dan Patch would often be seen pulling a cart through Oxford’s snowy streets, trailed by young boys who grabbed on the back and were pulled on their sleds for a free ride. Residents of the small town always thought of Dan as their own. At Dan Patch’s racing debut at a nearby fair during the late summer of 1900, it was reported every store in Oxford shut their doors so residents could journey to see him race. During the next two years, Dan’s fame grew as he raced at tracks throughout the midwest and on the East Coast at summer fairs and exhibitions. At the conclusion of each summer’s Grand Circuit, he would return to Oxford and the adulation of hundreds who would cheer his arrival at the train station. He would lead the walking procession back to his barn and those who were there stated he knew exactly how to navigate his way back to his stall. Dan Messner would routinely turn down offers to sell the horse, but, in early 1902, an offer of $20,000 was too tempting and Dan Patch was sold. On March 18, 1902, the beloved hometown champion left Oxford by train and journeyed on to immortality. Dan would race across America during the next seven years and be viewed and loved by thousands. He never lost a race and set a world record in the mile that would stand for 32 years. 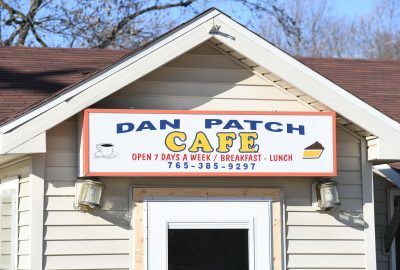 The Dan Patch Café (photo by Tom Ferry). 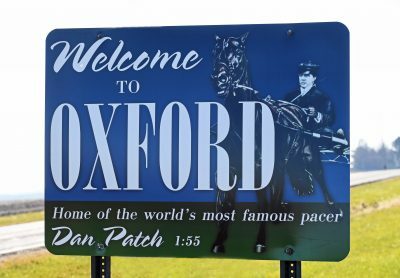 Like so many small towns across America, Oxford has suffered during the past half-century from the completion of the interstate highway system. People no longer needed to travel secondary roads that took them through the business districts of small towns in order to get to their ultimate destination. And unlike previous generations, baby boomers have often moved on from the towns of their birth to brighter lights, different lifestyles and better jobs. Passing time in Oxford has seen the closure of the high school, bowling alley, movie theater, speakeasy and even Dan Messner’s general store. One thing remains, however, and that is local pride in Dan Patch. The barn was finally opened in February 2006 when Dan Messner’s grandson and the home’s current resident John Messner and his wife Pam began a major renovation to the structure. Discovered in its interior were, among other things, remnants of two sulkies, three horse stalls and Dan Patch’s tack trunk, bearing the horse’s name in faded letters. And on the slats within what once was Dan’s stall, you could look closely and see evidence of cribbing marks. While the barn is only open to the public on special occasions, this permanent landmark draws a steady number of passersbys throughout the year who will stop their cars and take photos… and try to imagine a time, a place, a man and a horse. 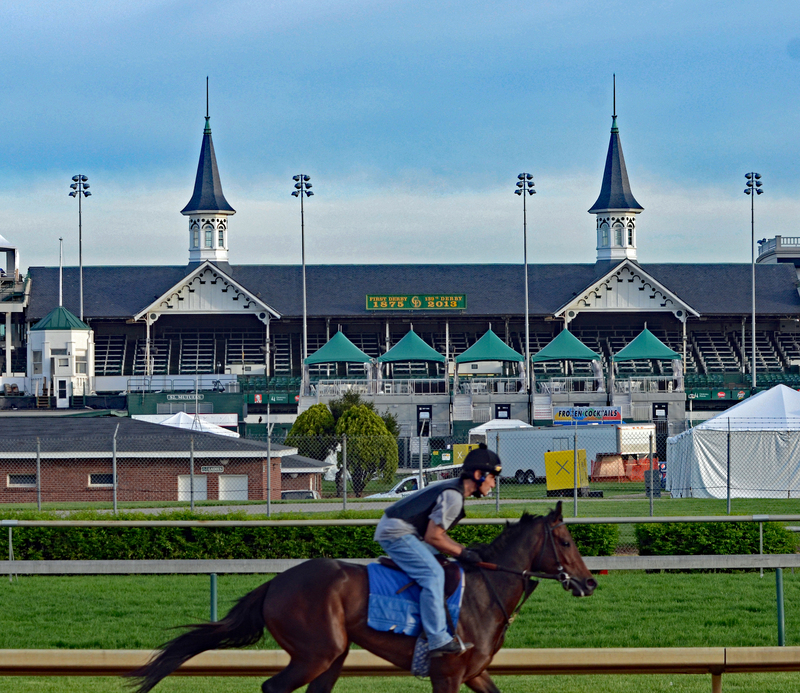 Horse galloping past the Twin Spires of Churchill Downs (photo by Tom Ferry). If Churchill Downs is American thoroughbred horse racing’s cathedral, then its steeple and eternal landmark is the Twin Spires. These two pinnacles cast a glow up and down Louisville, Kentucky’s Central Avenue and across the landscape of horse racing history. The Spires are easily the most recognizable symbol in the Sport of Kings and, arguably, in all of sports. It is difficult to take a mental portrait of the Churchill Downs racecourse where the spires are not present and prominent. In the late spring of 1894, the first 20 editions of the Kentucky Derby had come and gone and the Churchill Downs track (then called the Louisville Jockey Club) was facing bankruptcy. Twenty-four-year-old architect Joseph Dominic Baldez was contacted to help build the track’s new grandstand. Original plans did not call for the spires and they were pretty much an afterthought. Baldez felt the grandstand required something to accentuate its appearance and give it pizzazz. The spire was a very popular architectural element during the late 1800s and Baldez had a style based on symmetry and balance. 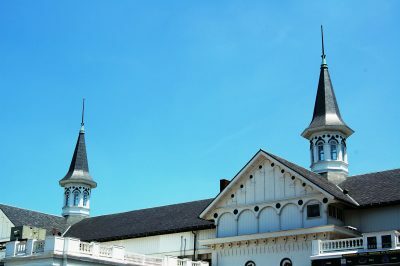 As a result, the spires are 12 feet wide, 134 feet from center to center and rise 55 feet from the grandstand’s roofline to the top of the adorning king posts. Each spire has eight rounded, closed windows that were originally left open in their early days. The Twin Spires made their debut on Monday, May 6, 1895 at the 21st Kentucky Derby. Thus, the Run for the Roses hasn’t always been held on the first Saturday in May — but close enough. The Spires have grown in mystique with passing time and even adorned Kentucky license plates for close to ten years. Yet, the sun shines bright on the entirety of Churchill Downs. Take a walk through the grounds and you will find an engaging mix of the old and the new. Every Derby champion is listed on plaques throughout the concourse. The very first champion, Aristides, has been memorialized with a statue in the paddock, as has Hall of Fame jockey Pat Day. The Twin Spires (photo by Tom Ferry). In recent years, additions have included new luxury suites, a Turf Club and lounge, a Skye Terrace, new Millionaire’s Row, increased restroom facilities and new balconies, overlooking both the track and the paddock. Perhaps most stunning was the addition of two massive towers to the left and right of the Twin Spires. The towers brought 2,800 additional seats to the total capacity but have not detracted all that much from the majesty of the spires. Walk the corridors beneath the grandstand and you will come across the old, abandoned betting windows. An eyesore? Not really, but rather nostalgic, lasting memories of days gone by. And when you leave the paddock and stroll through the tunnel heading out to the track, stop and pause for a minute and imagine the great horses and humans that once tread this ground. One day a year, the eyes of the sports world are focused on Churchill Downs. The track is filled with decorative spring hats, mint juleps, celebrities, pageantry and, of course, roses. The Twin Spires, however, stand tall during winter, spring, summer and fall. More than 120 years have passed and Churchill Downs has seen a pretty good return on that initial investment. The White Pine (photo by Tom Ferry). The paddock area at Belmont Park on major racing days can be electric. There is little mistaking you are in New York when surrounded by passionate, knowledgeable fans who never hesitate to let jockeys, connections and even horses know how they are performing, favorably or otherwise. A focal point of the paddock is an incredible statue of Secretariat, portraying the legendary champion stretched out in full flight. The sculpture commemorates his 31-length triumph in the 1973 Belmont Stakes to win the Triple Crown. The paddock area also serves as a festive picnic area during the track’s racing meets. 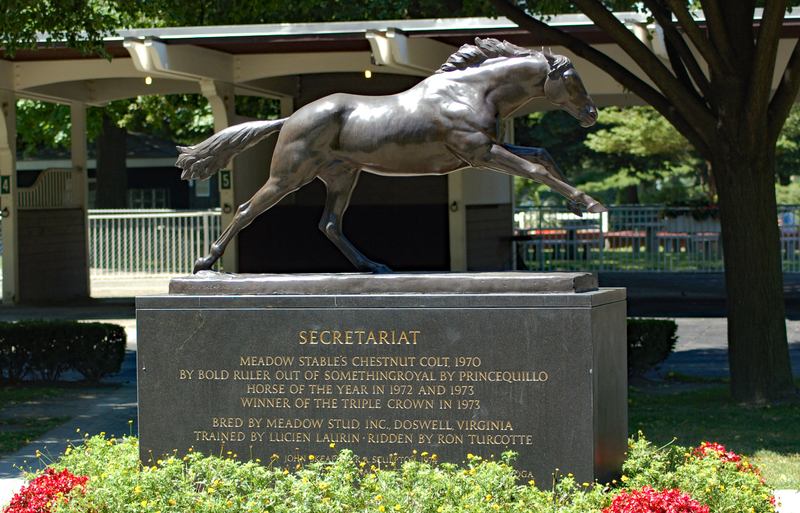 The Secretariat statue resides adjacent to the White Pine in Belmont’s paddock (photo by Tom Ferry). 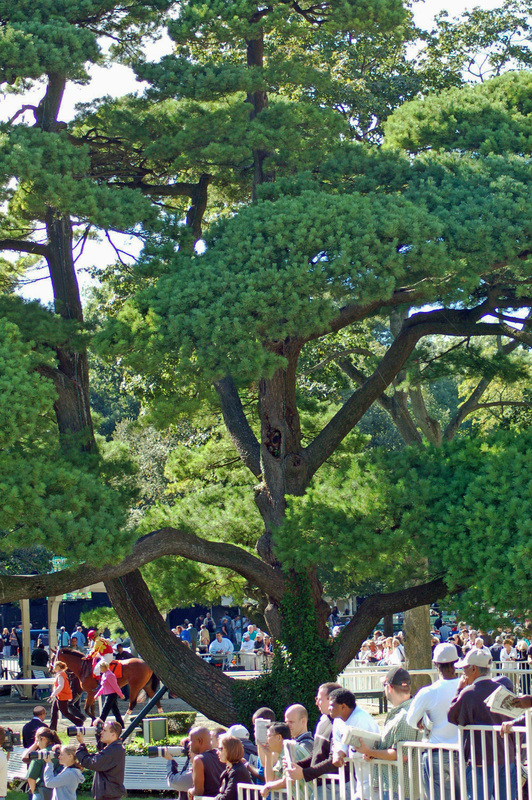 However, much like the combination of the Twin Spires and Churchill Downs, take away the White Pine from the paddock area and Belmont Park just isn’t the same. While it may not be a singular focus of photographs taken during a day at the races, it is always present. Take a look at old snapshots of Belmont Park from the early portion of the 20th Century, and there is the tree — in the background, casting its shade with sweeping, expansive limbs in faded sepia and black and white. It has been part of the track’s official logo since 1968. And, perhaps, the current version illustrates the White Pine’s magnitude and significance throughout Belmont Park and the history of Thoroughbred horse racing best. The logo simply displays a man, a horse, a couple of bystanders… and a tree. 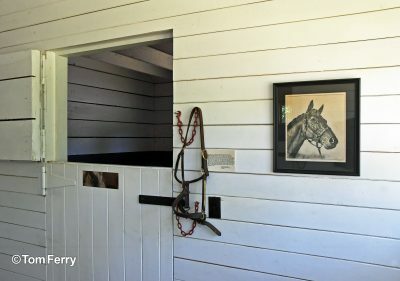 The barn that the great Man o’War called home (photo by Tom Ferry). I entered the lobby of the main office at Mt. Brilliant Farm and checked in at the front desk. The receptionist directed me to drive back out through the farm’s main entrance, turn right on Huffman Mill Pike, head up the road a ways and turn right again, through a gate marked Faraway Division. Mares and stallions in the distant Mt. Brilliant paddocks watched me closely, but otherwise I was alone. I got out of my car and slowly walked down a hedge-lined path toward the solitary green and white barn. When I reached the side-by-side barn doors, I grabbed both handles, paused, took a breath, and pulled the doors apart. Rays of sunlight illuminated the interior through a variety of windows. As I walked inside, brown-paneled stalls in each of four corners surrounded me. Each had brass nameplates centered on the stall doors. The first read American Flag. I turned the corner and saw the name Crusader on another. The door across the aisle said Golden Broom. Then, I approached the remaining stall. The world of horse racing has brought me many thrills across the years, from Secretariat’s incredible 31-length victory in the 1973 Belmont Stakes, to singing My Old Kentucky Home in unison with more than 150,000 others at my first Kentucky Derby. But gazing upon the stall once occupied by Man O’War brought a type of excitement different from any before. Nearly 70 years have passed since he walked the earth at Faraway Farm… all those people, all those miles — to see one horse. I knew I was walking on sacred ground. 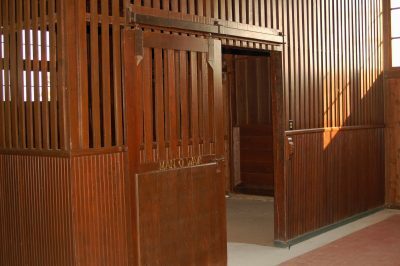 I peered through the stall’s parallel slats at the bare stall floor and tried to hear the resonant echoes of the great horse’s groom, the late Will Harbut, as he had once enthralled thousands of tour groups so many years ago. I guess standing there alone with my thoughts made it all the more special. And as I drove away from Faraway that afternoon, I knew I wanted to capture that feeling again. Man o’War’s stall (photo by Tom Ferry). That desire has taken me to 20 different states during the past 15 years in search of American horseracing’s most magical places. Not just Thoroughbred venues mind you, but also Standardbred, steeplechase and Quarter Horse racing landmarks as well. In this continuing series, I will share with you many of these iconic places. I carefully refrain from calling any of them the most magical. What is special to one, may be nondescript to another. The series will capture the special places in the world of horse racing in the form of farms, barns, racetracks, cemeteries, a trophy room, a statue, a tree and two wooden octagonal spires. While most of these landmarks are readily accessible to the general public, a few are not. In these cases, I am most grateful to the management of the venues for their graciousness and shared passion. I hope you enjoy this journey across the landscape of American horse racing. The faces, places and memories evoked along the way are timeless. Can You Make a Living Playing the Races?